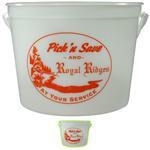 Custom Sand Pails and Promotional Buckets in a 32 oz size with your logo by Adco Marketing. 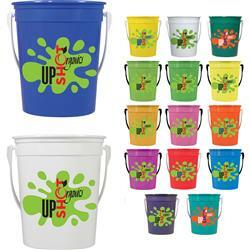 Available in a variety of colors for both the handles and body, these Made in the USA custom sand pails are great for kids gifts and fun beach toys. A great promotional item for the company picnic! Lids and shovels available! Production Times Available: 7 to 10-working days after proof approval. Rush available - please inquire. Typical Imprint Area(s): 3.5 in x 11.5 in for full wrap. Two sided imprint available. Plastic Sand Pails, Made in USA. Custom Shovels and Lids Available.